The E Brook flows in an artificial channel all the way from Upper Holland Road to Eachelhurst Road, where it crosses the old boundary of Sutton. In the Middle Ages, when the brook followed its natural course, there were no bridges over this stretch of the stream - there were fords in the three roads which crossed it, Wylde Green Road, Penns Lane and Eachelhurst Road. In the Middle Ages there was a ford at Stonebed Meadow (now Upper Holland Road) where the stream widened out across a patch of stony ground, and near here the local people came to rett their hemp. Practically every cottage and small dwelling had a patch of ground nearby called a hemppleck where this crop was grown for its fibre. 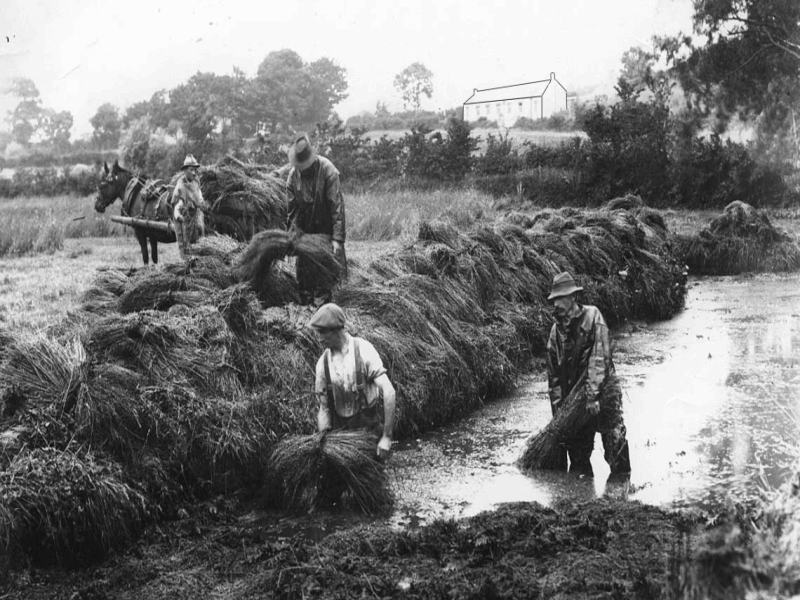 To produce the fibre, bundles of stalks were submerged in water for about ten days, after which the fibre could easily be separated to be made into a coarse cloth - many an artisan’s or farm labourer’s working clothes were made of hemp. At a Court Leet held in Sutton in 1599 it was “ordered that the inhabitants of this manor should not rett their hemp and their flax in Stanbed Forde nor in any place in the stream that runs from from Sutton Mill up to Pennes Mill under penalty for each and every offence 20s.” This order seems to have been an attempt to end the centuries-old custom, and was modified at the next court to “no person within this manor shall place any linen or hemp in any running stream or pool where his neighbour’s animals drink under penalty for each and every offence 3s 4d”. Now the stream passes beneath Ebrook Road and the railway into New Hall Valley, where its meandering course was changed in the late sixteenth century as the flow of water was used to power watermills. The stream was channelled into a kilometre-long leat to feed the mill pool at New Hall Mill, taking the water away from the wet valley bottom so that the meadows would be less waterlogged. The bank of this leat was breached by flood waters 100 years ago, and in places the valley is once again in a marshy condition, as can be seen from the board walk there. Below Penns Lane the E Brook meandered past the Eachelhurst Bottoms, not properly drained until the eighteenth century. Here the brook formed the boundary between Sutton and Erdington before crossing Eachelhurst Road and into the hamlet of Minworth. There was a boundary change in 1923, bringing this section of the E Brook, now Plants Brook Nature Reserve, with its pools and wetlands into the Borough of Sutton Coldfield. From here the brook passed beneath the canal and Kingsbruy Road and across the water meadows to the Tame - until it was culverted, first beneath the airfield and now beneath the Castle Vale Estate.